The rhizoma of Cibotium barometz (L.) J. Sm. of family Dicksoniaceae. .
Yunnan, Guangxi, Zhejiang provinces, etc. Bland and slightly astringent in flavor without foul smell. Even thickness of the piece, solidness, baldness, and no hollowness. Cut into thick pieces and used after stir-baked in sand. Pungent, bitter, sweet, warm; liver and kidney meridians entered. 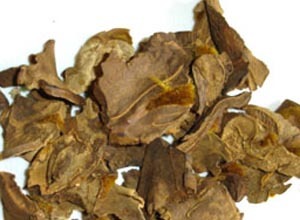 Dispel wind-damp, tonify liver and kidney, strengthen waist and knees. Being pungent, bitter and warm with the actions of dispelling wind, expelling cold and removing dampness, while sweet with tonifying liver and kidney, strengthening waist and knees, and consolidating tendons and bones, it is most suitable for treating deficiency of liver and kidney accompanied by waist pain, stiffness of spine and difficulty in bending and stretching due to pathogenic wind, cold and dampness, and often combined with liver-kidney tonics and waist-knees strengthening herbs, such as Du Zhong, Xu Duan and Sang Ji Sheng, etc. It has the actions of tonifying liver and kidney, and strengthening waist and knees, can be used to treat deficiency of liver and kidney, sores and weakness of waist and knees, and weakness of lower extremities. It can be combined with liver-kidney tonics, for example, Du Zhong, Niu Xi, Shu Di and Lu Jiao Jiao, etc. C. Furthermore, it has a slight action of warming, tonifying and securing. It is indicated for insecurity due to kidney deficiency manifested by frequent micturition, enuresis and spermatorrhea, and often combined with kidney-tonics, essence-securing and urination-reducing herbs, such as Yi Zhi Ren, Bu Gu Zhi and Du Zhong. 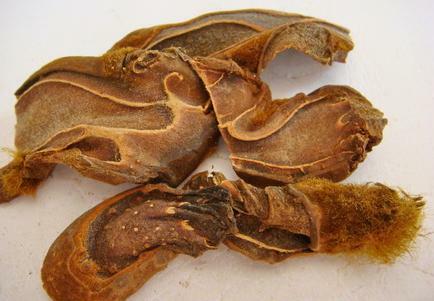 For deficiency cold of thoroughfare and conception vessel, profuse and clear leukorrhea, it should be combined with kidney-warming and leucorrhea-relieving herbs, for example, Lu Rong, Lian Zi and Ai Ye, etc. It should be used cautiously to patients with kidney deficiency accompanied with heat, difficulty in micturition or scanty deep-colored urine with pain.